Cafés Richard capsules, guaranteed to be aluminium-free, are compatible with Vetura Cafés Richard capsule machines and FAP machines (for universal capsules). These coffee capsules are made from grand cru coffees coming from the best origins to provide incomparable flavours. 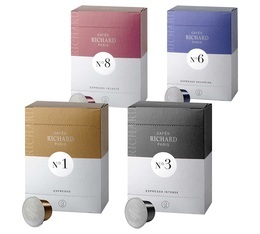 All of Cafés Richard's expertise are shown through this range of capsules, offering you high-quality espressos! 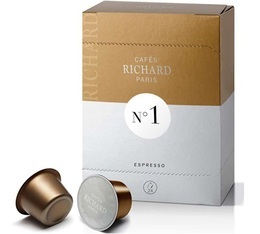 Pack of 24 Cafés Richard Premium N°1 espresso capsules for Cafés Richard Ventura machines. This rounded blend creates a balanced espresso.